The Lib Dems have promised to reverse the "slow death" of civil liberties by repealing a series of "authoritarian" measures introduced by the government. Proposals in its "Freedom Bill" include a full-scale review of the use of CCTV cameras, the abolition of ID cards and control orders for terror suspects. The party also wants to see the ban on protests outside Parliament without prior police permission lifted. Ministers say they have acted clearly to protect the public and tackle crime. However, the government was criticised last month by an all-party Lords Committee for allowing surveillance and collection of peoples' personal data to become "pervasive". The Lib Dems said Labour had "presided over the slow death by a thousand cuts of our hard-won British freedoms". It is calling for much of the controversial policing and criminal justice legislation introduced in recent years to be reversed. It says the period in which terror suspects can be held without being charged should be scaled back from 28 to 14 days, overturning the extension introduced in 2006. Freedom of Information laws should be not be subject to ministerial veto, it argues, barring a repeat of the government's "shameful" decision on Tuesday to veto the publication of minutes of Cabinet meetings in the run-up to the Iraq war. Other proposals would see only those charged and convicted of a criminal offence having their details listed on the national DNA database while juries would no longer be given details of defendants' previous offences. 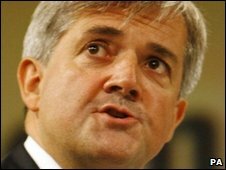 "The Freedom Bill will repeal 20 years of attacks on our civil liberties from both Labour and Conservative governments," said the party's home affairs spokesman Chris Huhne. "With one small change after another over the last 20 years, the cumulative loss of civil liberties is huge." Both the Lib Dems and the Conservatives have said they would scrap the government's flagship ID cards scheme. Home secretary Jacqui Smith said in December that claims the UK had become a "surveillance society" were wide of the mark. But she said she would act over concerns that councils and other public bodies were misusing surveillance powers to pursue people for trivial offences by clarifying the scope of the rules.